Note: I’m editing two new essays this week. 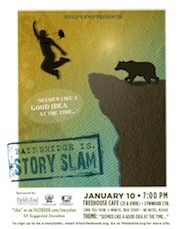 While those are in the works, here’s some light reading: a transcript of the true-life tale I told recently at the Bainbridge Island Story Slam. When I was 24, I had a job writing speeches for a packaged meats executive. I took the job because when you are 24 you believe that writing about the packaged meats industry could easily lead to writing for The New Yorker. The trajectory looks smooth. Inevitable, really. In other words, it seemed like a good idea at the time. The problem was: I had no idea what I was doing. Writing about the packaged meats industry might sound absurd—and indeed it was—but when you know very little about packaged meats and even less about industry, it can also seem quite difficult. It took me ages to write these speeches and for one in particular, I ended up staying at the office overnight to meet a morning deadline. During the night, I got really tired, and I felt the need to rest for a few minutes. I had a tiny office, so I lay down under my desk, on my back, my feet sticking out à la the Wicked Witch of the West. While I was lying there, the security guard was doing his rounds of the floor. When he saw me, apparently his professional instincts just abandoned him entirely, because he started…screaming. Screaming his big, bald head off. Terrified by this big, bald head screaming at me from my doorway, I screamed back. It was like that scene when ET and 7-year-old Drew Barrymore meet for the first time: a bizarrely long episode of high-pitched, mutual screaming. Until that night, the security guard and I had hardly spoken. But after that—perhaps because we had revealed to each other how fundamentally unfit we were to perform our respective jobs—we became friends. Dear MK and Tracy, thank you for your kind comments! Much appreciated.